In one of my most popular blogs with readers I talked about Haunted dolls- where real life spirits attach to a certain host doll. Nobody really knows if the spirit picks that host doll, or if they are just drawn there, but we do know it happens. Often the spirits that possess the dolls are troubled and want to send a message and seek help, in the rare occasion a demonic entity can possess a doll. But what happens when you put a curse on a doll or a doll itself is cursed? Instead of a possessed doll inhabited by the spirit of a former owner how about it being used as a vessel or vehicle for evil, revenge or destructive intent? When I think of evil intent (involving satanic practice) forced and surrounding a doll my first thought is of a Voodoo Doll, and most of us we have been introduced to this by visits to New Orleans, Louisiana and though Hollywood horror films. Actually Voodoo originated and is one of many incarnations of African-based spiritual folkways rooted in West African Dahomeyan Vodun carried over with the slaves to Haiti and then the U.S. Originally the purpose of using dolls was primarily for attracting love, power, and fortune, and for undoing hexes. 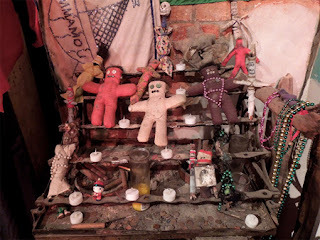 Despite their menacing image in our culture, Voodoo dolls are usually used to bless, rather than curse. Pins are stuck into the doll not to cause pain, but to attach a photo of the person who is to be blessed (or cursed). To curse. This is a terrifying concept where someone with supernatural help makes an effigy with the cruel intent to curse, control or manipulate or harm a fellow human being who has been selected for punishment. Does this really work or is the power of suggestion so intense that psychic energy is created that can evoke strange illness or a deadly outcome? There have been cases on the Island of Haiti, where Voodoo is practiced, that some people have been literally scared to death by thinking their soul was embedded in a doll and then cursed for all eternity! This is powerful stuff! Did you know that Voodoo is an ancient practice that dates to the late Egyptian and Greco-Roman Period? Wax dolls were found in Egypt in late antiquity. The dolls were placed in a variety of places, with graves being the most popular. Other places included homes, sanctuaries, and in what used to be bodies of water. Plato mentioned that dolls were displayed at points where three roads met, on doors and on parental graves. They are often represented as bound and twisted into violent positions. Occasionally, the dolls were mutilated (hands, legs, head, etc. chopped off) or if wax, melted. 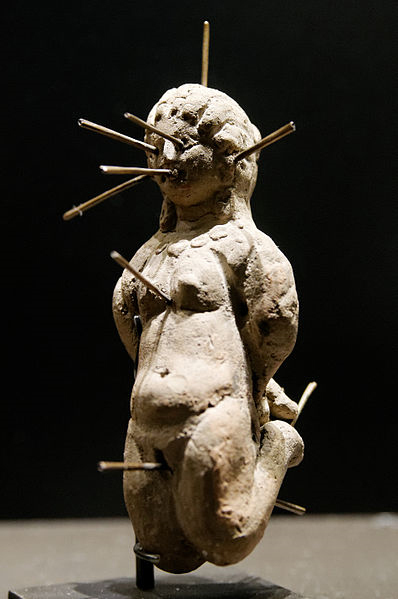 Voodoo dolls (or Kolossoi as the Greeks called them) were also quite popular in the Greco-Roman world. Made of lead or bronze, there was a certain criteria to make a cursed doll: (1) the doll’s arms or legs aretwisted behind its back as if bound (2) the doll is transfixed with nails (3)the head or feet or upper torso of the doll has been twisted back to front (4) the doll is tightly shut container (5) the doll has been inscribed with a victim’s name (6) the doll has been discovered in a grave, sanctuary or in (what was) water. Dolls were often associated with curse tablets in that they were often inscribed with the name of the curse victim. A lead ‘gingerbread man’ from Carystus (ancient city-state in Greece) was apparently crafted so that it could be flattened and used as a curse tablet. These guys meant business! Getting back to the type of Voodoo we are familiar with, Louisiana Voodoo developed as a cultural form mixing Catholicism and French, Spanish and Creole in southern Louisiana as a result of the slave trade. Louisiana Voodoo is often confused with—but is not completely separable from—Haitian Vodou and southern Hoodoo. It differs from Vodou in its emphasis upon Gris-gris, voodoo queens, use of Hoodoo occultparaphernalia, and Li Grand Zombi (snake deity). It was through Louisiana Voodoo that such terms as gris-gris (a voodoo amulet originating in Africawhich is believed to protect the wearer from evil or brings luck) and voodoo dolls were introduced into the American lexicon. Recently a friend of mine showed me an AUTHENTIC Voodoo Doll she picked up on a trip to New Orleans, Louisiana. Its 10 inches tall including the colorful feather headdress and adorned with glittering pendants. An instruction guide came attached to the doll along with a white pin and a black pin. A Gris Gris bag is also attached and used to hold herbs and potions. You are supposed to use the white pin for good and the black pin for evil or revenge. Here is the problem: The word AUTHENTIC is a big draw for fooling people. 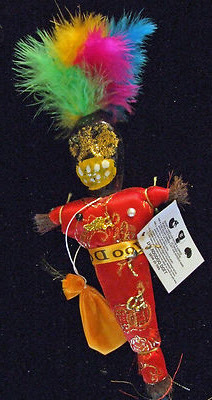 No respectable voodoo witch doctor will commercialize themselves for $6.95 for a voodoo doll. A voodoo doll is a special item, and not something that can be made in duplicate. This item, I discovered, was made in China! Sacrilege! The Voodoo Doll came with a white tag with instructions on it that I swear I didn't make this up. Then what? You just unleashed forces you have no idea how to control or deactivate. What can you do? You will realize is not a game but can be deadly serious. 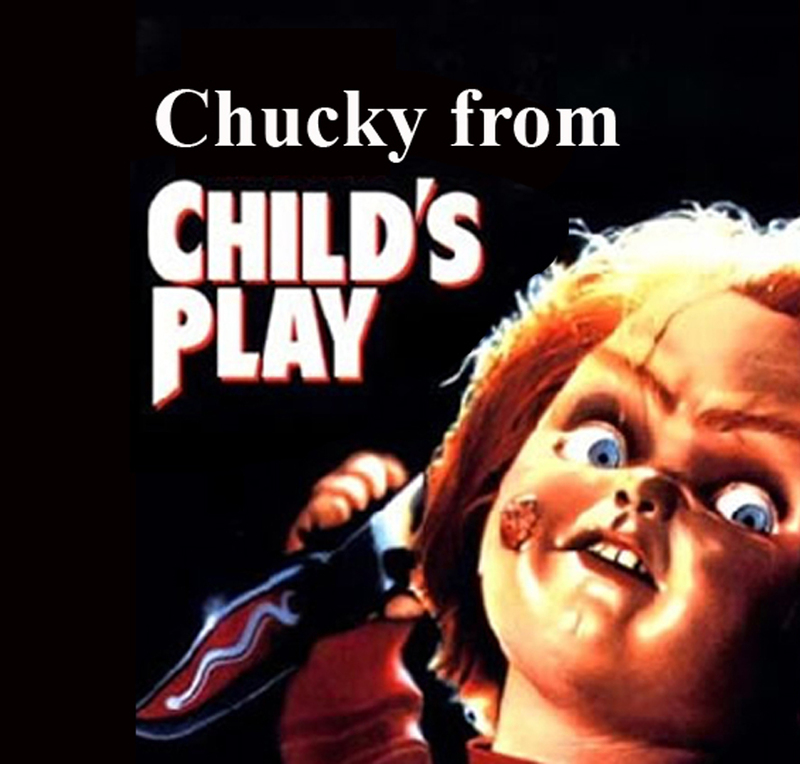 Who can forget the plot to this classic horror movie, Chucky. A homicidal killer is cornered and lays wounded and dying in a toy warehouse after being shot by a police detective. Charles transfers his soul into a "Good-Guy" doll, after coming across boxes of them. The voodoo ritual causes a lighting strike to destroy the shop; the detective survives, finding Charles' motionless body. Later, young Andy Barclay receives a much sought after Good Guy Doll for his birthday. The doll, known as Chucky, brings Andy much joy, until a string of brutal murders begin to surround Andy and Chucky and it’s up to the Detective and Andy’s mother to save Andy from a fate worse than death. This doll became a living breathing entity that could inflict pain and death and also could be “killed” –although the 5 sequels after the first movie would make you think otherwise. Lately, judging by the numerous websites devoted to this subject of possessed, cursed and Voodoo dolls, their popularity and acceptance into our culture has grown significantly. Ebay, currently has over 3700 listings for Voodoo dolls and 77 listings for cursed dolls. There is a market for this and profits to be made. Many manufacturers such as “Gothic American Dolls” present packaged dolls in forms of Living Dead Dolls and people are buying them. 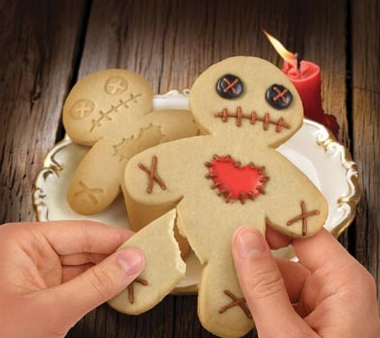 "Voodoo dolls" have become a popular subject for products you wouldn't believe! As if we don’t have enough on the market of this type of doll, Doll artists are making them from all kinds of various materials or “making over” older dolls and selling them as “cursed”“haunted” or “dead or corpse dolls” sometimes with their own coffins! That is their right as creative people and expressing their art. I find it highly offensive to my sensibilities as a long time doll collector,who has spent years restoring dolls that were in deplorable and horrible condition. I have labored to bring them back to their original condition for preservation for future generations and to see a perfectly good vintage or modern plastic or vinyl child or baby doll turned into a creatures of the night-zombie or vampire or a ragged corpses by manipulating the original surface by burning it, painting it or combining different body parts (a la Frankenstein) just turns my stomach. But- To each his own and taste. As I wrote before Dolls reflect our past, present, culture and us. Our deep fascination with the macabre, haunted and cursed dolls maybe be just another passing faze. What is next? Cursed Cookies anyone?